Proposal would rezone manufacturing district and facilitate affordable housing on Culver El site. On August 25, the City Planning Commission approved the Department of City Planning and the Department of Housing Preservation and Development’s Culver El Proposal. The proposal would rezone a seven-block portion of Borough Park, Brooklyn, generally bounded by 36th Street to the north, 39th Street to the south, Old Utrecht Road to the east, and 12th Avenue to the west. The plan would facilitate the development of a 68-unit housing project on two narrow, City-owned parcels formerly occupied by the elevated BMT Culver Shuttle line. The parcels are located on the south side of 37th Street between 12th and 14th Avenues. The rezoning area was historically used for manufacturing, but is now predominantly characterized by residential uses consisting of two-story attached and detached homes. The plan would establish a new Special Mixed Use District and replace the area’s M1-1 and M1-2 manufacturing districts with M1-2/ R6A and M1-2/R6B districts to reflect the neighborhood’s current development. Planning would extend an existing R5 district south to include a portion of the block running from 36th and 37th Streets, between 12th and 13th Avenues. The proposal would also rezone the block bounded by 36th and 37th Streets, and Old Utrecht Road and 13th Avenue from M1-2 to C4-2A. This block is occupied by the Bergament Outlet department store. 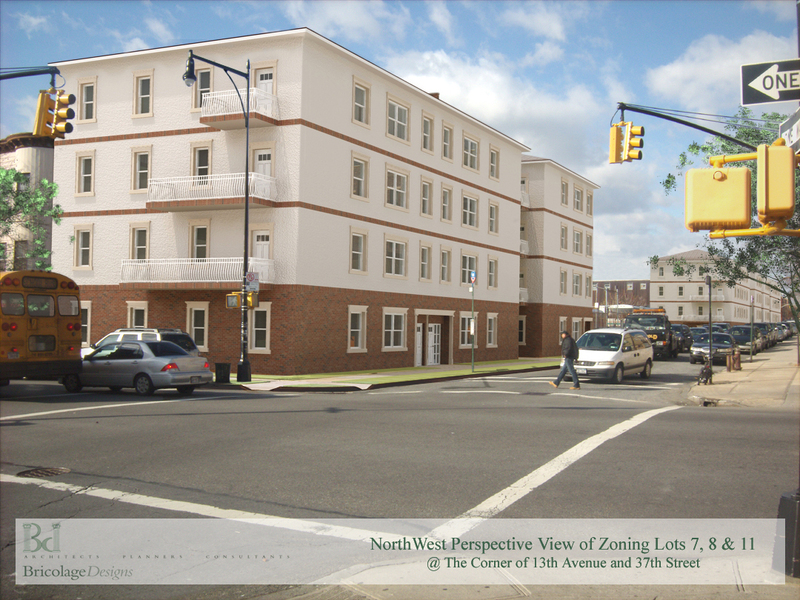 HPD selected the Southern Brooklyn Community Organization to build seventeen four-story, fourunit buildings and three parking lots with a total of 48 spaces on the Culver El right-of-ways. The project would provide 110,776 sq.ft. of residential space, 14,887 sq.ft. of open space, seventeen parking spaces for residents, and 31 spaces for existing community facilities in the area. The affordable housing would be created under HPD’s New Foundations home ownership program, and the units would have a fifteen-year resale restriction. The developer would market the units to families earning between 80 and 110 percent of area median income. Brooklyn Borough President Marty Markowitz and local Council Member Brad Lander generally supported the plan, but both officials requested that the housing project’s units remain permanently affordable under the City’s Inclusionary Housing Program. Markowitz also recommended that the Commission require the owner of the Bergament property to provide affordable housing if it redeveloped the site. Lander suggested that the site should either be removed from the proposal or rezoned to C8-2, which does not permit residential uses. At the Commission’s July 28 hearing, attorney Adam Rothkrug, representing the developer , testified that SBCO’s primary function was to provide affordable housing and that the New Foundations program was the most effective way to develop the proposed project. HPD’s Jack Hammer explained that while the Inclusionary Housing Program’s home ownership model requires developers to offer longer term affordable units, it only applies to twenty percent of the units. Hammer pointed out that 100 percent of the units would be affordable under the New Foundations program. The Commission unanimously approved the proposal, noting that it would provide a framework for future development that recognized the area’s diverse mix of uses.The Commission also noted that the proposal would create opportunities for growth, and lead to development of affordable housing on an underutilized site. CPC: Culver El (C 100345 ZMK – rezoning) (C 100347 HAK – UDAAP) (C 100348 ZSK – C 1000361 ZSK – special permits)(Aug. 25, 2010) (Architect: Bricolage Designs).